Sparkle & Shine: BUILDING A WARDROBE YOU LOVE PART 2: GET PIN-SPIRED! 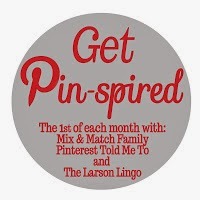 Soooo let's get inspired...or should I say, PIN-spired!! I can't tell you how many times I've said, " I don't know what I did before Pinterest!" Any aspect of my life where I need some bright ideas, from teaching to Sunday School to recipes to crafts to how to unshrink clothes--all I have to do is type in my search on Pinterest and 99% of the time, I can find an amazing idea...or ten! One of the main things I have been using Pinterest for in the past year has been outfit ideas. See, I am not a very creative person by nature. I need a little jump start and then I can "make something better." But I need some inspiration to get the creative juices flowing if you catch my drift. Pinterest comes in soooo handy for this!!! 1. One Piece: Take a piece of clothing in your closet that you love. For instance, a striped shirt. I'm using that example, because it IS one of my Classic Casual Wardrobe Staples! 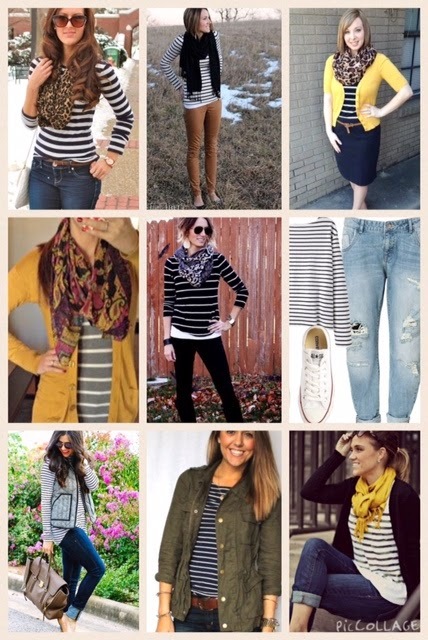 Type in "striped shirt" or "striped tee" into Pinterest. Bam--I bet you can Pin at least 10 different outfit ideas. Some of these ideas you may have never thought of, such as mixing stripes and florals! Also, remember last week when I talked about that piece of clothing that you love, but have no idea how to wear it? 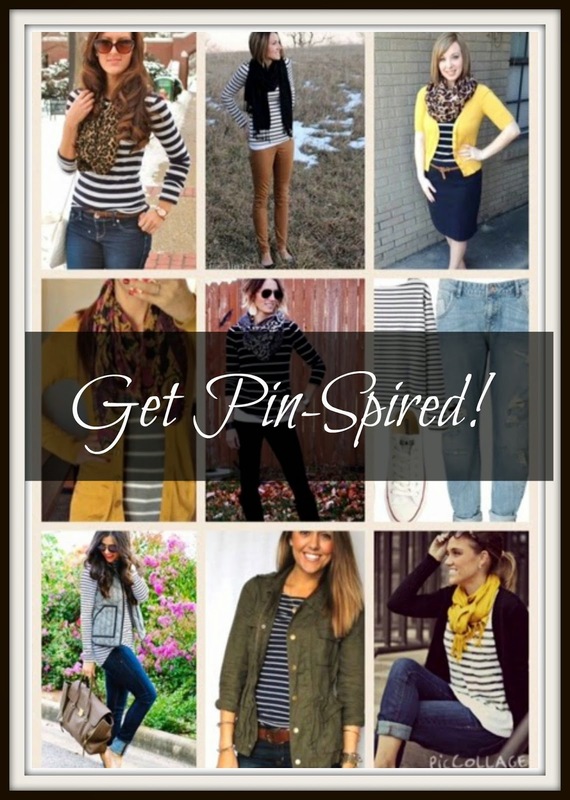 This is the perfect opportunity to type that item into the Pinterest search bar and get inspired to wear the item again! 2. One Season: If I just want some fresh ideas, but don't really have any certain pieces of clothing or a style in mind, search by season to get outfit ideas by that season. I just type in "Fall Outfits" or "Spring Outfits" or "Casual fall outfits." 3. Color Combinations: When you are browsing through outfits on Pinterest, look for color combinations or patterns that appeal to you, too. I have found several color combinations I liked on Pinterest that I never would have thought of on my own. My latest fave is black, brown and grey! That was all from Pinterest! ... inspired this outfit. My outfit looks nothing like the Pinterest outfit, but I was just looking at the colors of black, brown and grey. Then I worked with the items I had in my closet. I saw this Pinterest collage and learned that I LOVE burgundy and mustard (yellow)! Again, this Pinterest outfit looks nothing like the one I created, but I just realized coral and leopard were awesome together! 4. Unexact: You don't have to follow the Pinterest picture exactly (please don't, you'll go broke buying clothes!). Just keep an eye out for "looks" you like and use similar items in your closet. I typically find an outfit that I really like, then make it my own by using whatever I have in my closet. Here I liked the idea of polka dots, leopard and a vest--but I used the leopard in the scarf vs. in the shoes. Little changes like that--just make it your own! Hope this helps you get Pin-spired to put together some new outfits! I think you'll discover you have a lot more in your closet than you think! You can follow any of my boards on Pinterest, HERE. 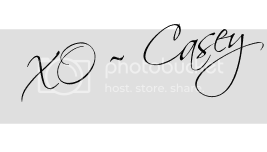 You can also Pin any of the pictures on this page (or in any post)--just hover over the picture and click the "Pin It" icon in the middle of the photo. Next week is a big week!! I'll talk about making a shopping list of spring items and give you a basic "wardrobe building list." See ya back here soon! 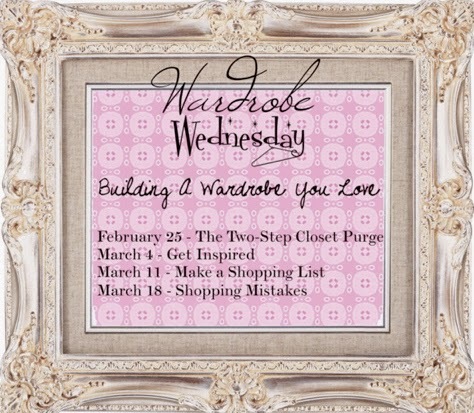 In case you missed the first part of the Building a Wardrobe You Love series, you can find it HERE. Awesome, some great ideas! Got to love the ol' pinterest! Great ideas. And yes using pinterest as a guide instead of copying all the photos exactly is so the way to go. I like to use it as a tool when I am shopping too. Like if I was going to buy an item I think to myself "would I pin this? What outfit would I pin this with"? If the answer is no I check myself and put it back. I really love your last look and how you used the leopard inspiration for the scarf instead!! I'm totally like you - I need some creative inspiration to get the juices flowing because I am not naturally creative 100% on my own. I need ideas to get my mind to see things that I can't create in my mind alone. I love your suggestions and your pin-spired looks! 7 Pieces, 11 Outfits ~ The 7x11 Challenge !